What is it? The latest entry in baseball’s most accomplished strategy series, updated to include real teams for the first time. To sports fans of a certain persuasion, there remains no greater management sim in history than Championship Manager 01/02. That’s not to say that its creator, Sports Interactive, has failed to produce more realistic, similarly immersive games since then—but many, myself included, retain an unbroken bond with that particular series entry because it married depth with speed. Seasons flew by at Concorde velocity, with transfers arranged in seconds and matches completed in minutes. If you wanted to dabble with training techniques or other such intricacies they were all there, yet skipping those finer details took nothing away from the overall experience. Matches whizz by in a blur, and can be micro-managed to whatever level you’re content with. Want to throw every pitch and swing every bat, but let your assistant handle nuances such as fielding positions and baserunning? Done. Plays are handled via wonderfully non-repetitive text commentary, while a basic 2D pitch shows player and ball placement. The link between these is your imagination: the game tells you David Ortiz has belted a match-winning homer, but it’s up to you to picture a packed stadium of fans celebrating it. With 162 games in a single season, you’d be right to wonder whether things might slow down somewhere along the way. But OOTP packs in many methods of keeping things fresh. Player attributes (all out of 20) are updated every couple of months; factor in those changes alongside hot and cold streaks, trades, and the realistic frequency of injuries and there’s always thinking and tinkering to be done. Matches themselves come in all flavours: one-sided thrashings, victories snatched from defeat and vice versa, even ones that get rained off partway through—a new feature this year. On paper, this should be repetitive. It never, ever plays out that way. Instead the deeper you delve, the more not only your team comes to life, but the world around it. You’re given more control of the in-game universe than most sports management sims offer—for instance, being able to select the elite All-Star teams each season should you so please. By switching on commissioner mode you’re even able to force through trades that match those in real life. Essentially, the AI provides the framework of a massive baseball world, but it’s yours to tailor, or indeed ruin, as you see fit. OOTP 2016 sees the official MLB license incorporated for the first time. That means real teams and players, with all the right logos and career statistics—although, bizarrely, no player pictures. (Thankfully, a wealth of fan-created packs can be used to rectify this via ‘Add-ons Central’, accessible from the start screen.) 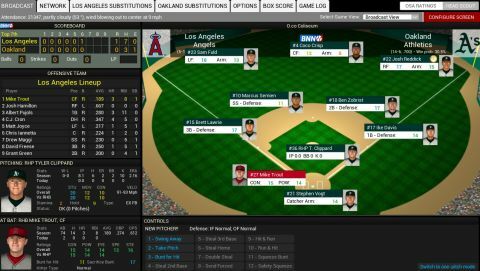 For baseball die-hards, an even bigger attraction is being able to replay any season from as far back as 1871, again with accurate teams, pitchers and batters. There can’t be a person on this earth keen to resuscitate the 1943 St Louis Browns, but the option is included anyway—just in case. Incredible. If there’s one criticism, it’s that new players face an Alpine-steep learning curve. I’ve been playing for seven years, and still have to have certain assists (like field positioning) switched on to avoid being hammered by the AI. It’s such an accurate representation of real baseball that you’d need a degree in financial management to fully grasp your team’s long-term budget, and the sport’s complex arbitration rules—which decree out-of-contract players’ earnings—make as much sense in game as real life. Additional clarity in these areas would benefit virtual sluggers both new and old. That being said, the odd confusing menu screen can’t detract from OOTP’s overall magnificence. The true measure of any world class game in this genre is whether it’s worth learning a new sport for. That was true of football favourite Championship Manager at the turn of the century, and puck-slapping upstart Eastside Hockey Manager in the mid-2000s. And without question, it applies here. This is a moonshot home run of a sports sim, and as perfect an introduction to American rounders as one could ever wish for.